art direction, photoshoot. brand enhancement, website redesign/development on drupal cms. 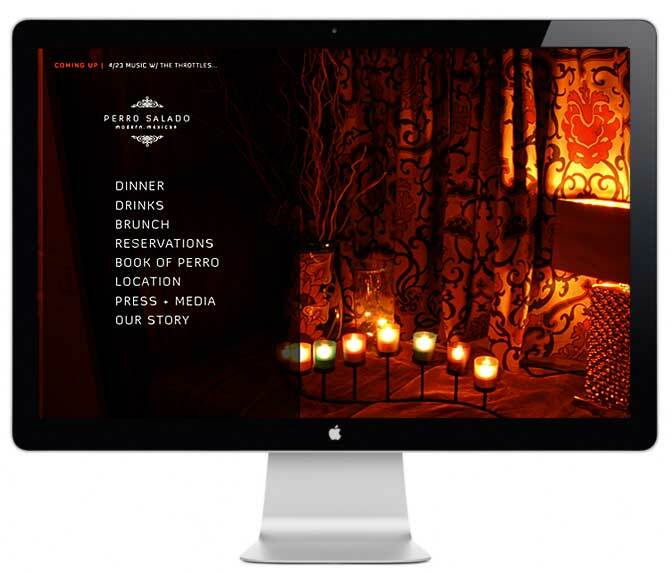 Perro Salado was one of Newport, RI’s best kept secrets for food, drinks and live music until the new brand and online presence Rubic created helped spread the word. The owners at Perro approached Rubic to redesign their online presence and wanted it to feel like their cozy, chic and creative restaurant interior. They also needed easy control over menu changes for daily specials, and wanted an easy way to use social media to drive foot traffic year round. Rubic art directed two photoshoots - one for food and another for “mood” shots. We also designed a unique look and feel that today continues to resonate and attract local and out-of-town visitors. Both websites maintain their own brand and personality however we cross-referenced content and menu offerings to ensure patrons would find and explore both restaurants. We continue to work together for print advertising, social media consulting, and website support and enhancements.